6 Surely goodness and lovingkindness will follow me all the days of my life, And I will dwell in the house of the LORD forever. In 2004 I was told that my unborn child would surely die. In 2009 I was told the same news about my husband. My unborn child suffered a stroke in utero and five years later his father was diagnosed with a brain tumor. During those incredibly difficult months of pregnancy in 2004 I allowed the truths of this psalm to permeate my being. I invited the shepherd into my pain and allowed him to guide me into paths of righteousness. He fed my weary heart, and I feasted upon his word as we walked slowly beside quiet waters. He restored my soul and lay beside me in green pastures. I awoke with prayers on my lips and cried out to him throughout my days. And even though I was walking through the valley of the shadow of death with my unborn child, I was holding the hand of my shepherd who I trusted to lead me into a peace that passes understanding as I rested in the knowledge that goodness and mercy were not only mine, but they were promises for my unborn baby as well. I was now a mom to three young children, pregnant with a fourth, and caring for a dying husband. I was exhausted and used this as an excuse to not seek the Lord regularly as I walked through the valley of the shadow of death again. I ignored the shepherd’s lead as I attempted to control the situation – oftentimes running ahead or grabbing the rod out of his hand. I was angry and raged against the injustice that he had allowed in my life. I spent that year exhausted in my own strength; resisting his lead to still waters and declined his invitation to be anointed with healing oil. 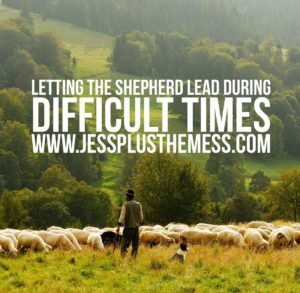 Two opportunities to be led and comforted by the shepherd. One heart – my heart – generally at peace in 2004 and full of rage and turmoil in 2009. One main difference – a choice to stay beside the shepherd or a choice to leave his side. My husband gained his eternal citizenship in Heaven a year after his diagnosis. He is now forever walking with the Shepherd. That unborn baby, Lucas, was miraculously born on August 12, 2004. He celebrated his 14th birthday last month – 14 years of walking with the shepherd. As I continue through this journey called life, now a part of a blended family with eight children, I still experience times of heartache and disappointment– as is the reality for all of us this side of eternity. You would think by now I would know to always let the shepherd lead, but I still occasionally struggle with a desire to run away; however, I’m quickly reminded of the peace that I experienced back in 2004 when I truly let the Shepherd lead and then I slowly get back on the path as the rod gently guides me. I would encourage you to do the same. Wherever you are in life – invite the shepherd in. It can be difficult to give up control but the peace that the Shepherd offers far outweighs the stress and anxiety that control demands. Let him lead, restore, anoint, and comfort you. Let him shepherd your heart. Can We Truly Forgive and Forget?